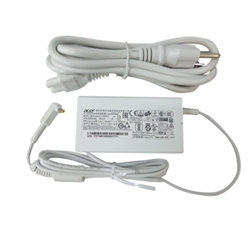 Description: New genuine Acer tablet white 65 watt ac adapter charger and power cord. Part #'s: KP.06503.007, KP.06503.006, PA-1650-80AW LF, NP.ADT11.00F. Acer Iconia Tab W700, W700P, W701, W701P.